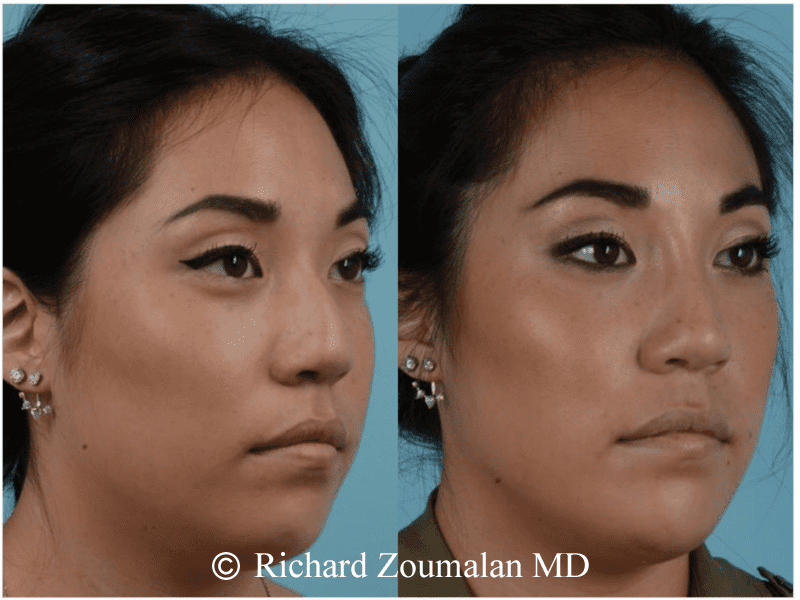 Non-surgical Rhinoplasty can be performed using one of two techniques: making areas thicker with filler, and making areas thinner with steroid injections. Dr. Zoumalan is an expert in both of these approaches. 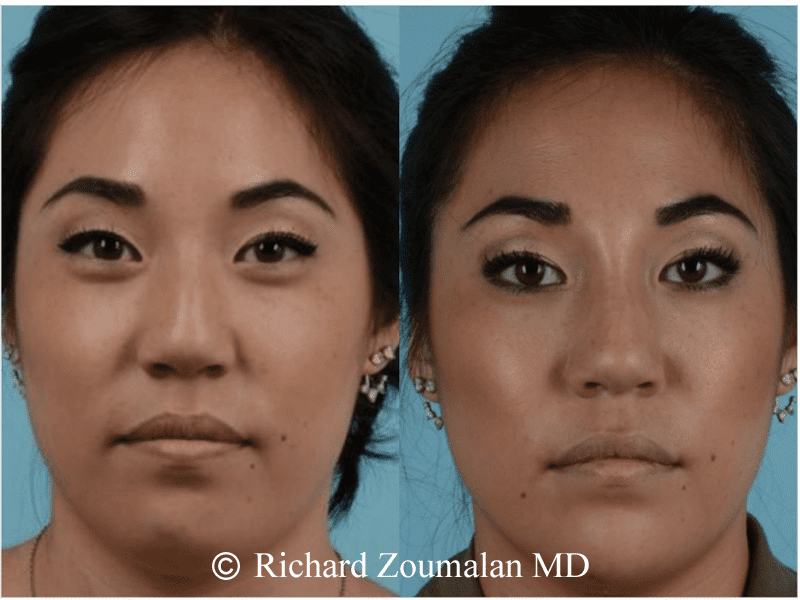 Using fillers in the nose is a recent development in facial plastic surgery. This is a technique that should be performed by experts, given the potential risks. Using filler to improve the prominence of the top part of the nose is the most safe and effective approach. This is because there is a planar separation between the skin and the structure of the nose. The lower third of the nose has thicker skin that is more adherent to the cartilage. It is more difficult to sculpt the nose with filler in the lower third. At the same time, the risks of serious potential skin complications are higher. Fillers to the nose can be done with temporary material or permanent material. The benefit of temporary material is that it can be reversed (removed/erased) if you are unhappy with the result. This is why Dr. Zoumalan chooses to use Hyaluronic Acid material such as Restylane and Voluma. Hyaluronic Acid is a naturally occurring material in the skin. This technique effectively places a manufactured material that occurs naturally into the nose. These products last 1 to 2 years or more, and they can be adjusted if you are not satisfied. Other options include Radiesse, Belotero, and Juvederm. Dr. Zoumalan has experience with all of these materials. Permanent material options include silicone. Dr. Zoumalan uses his tasteful eye and best judgment to determine whether your goals can be met using a non-surgical or surgical approach. 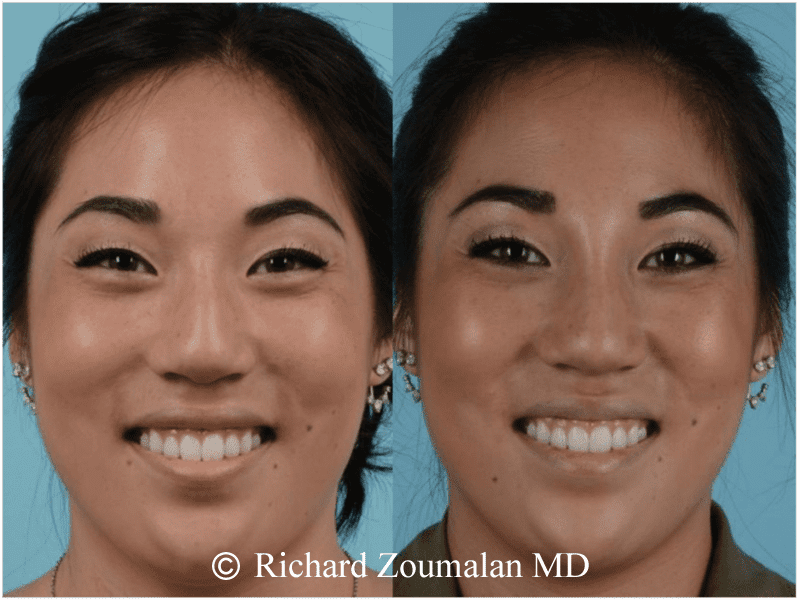 Often, although non-surgical techniques can significantly reduce any associated downtime, using filler offers short term satisfaction but ultimately more problems long-term. In consultation, Dr. Zoumalan aims to understand your goals so that he can decipher the best treatment for you. How can fillers help improve the appearance of my nose? 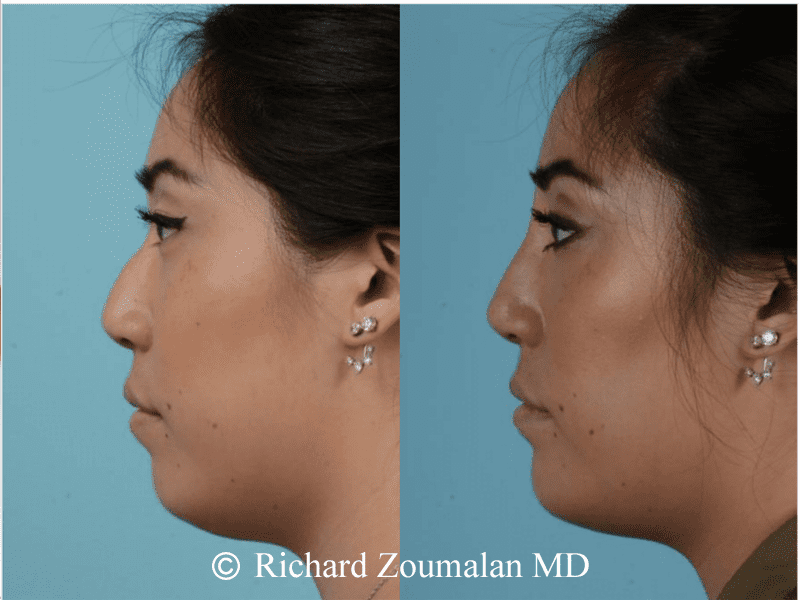 Improving slight asymmetries of the upper and middle third of the nose. Raising a deep radix. The radix is the area of the nose between the eyes. Disguising a small nasal hump by filling just above it. What are Non-Ideal Uses for Fillers to the Nose? Are Fillers to the Nose a Safe Option? If fillers to the nose are performed in a safe and conservative way, the complication rate is low. However, complications from fillers can be problematic. The biggest risk is having the filler get inside a blood vessel, or compress a blood vessel that provides blood flow to the skin of the nose. There are patients that have experienced devastating loss of skin on their nose which requires nasal reconstruction. For this reason, it is important to be evaluated by someone with extensive experience who can troubleshoot any possibility for complications. It is important to go consult with to a doctor that understands the delicate blood flow of the nose. 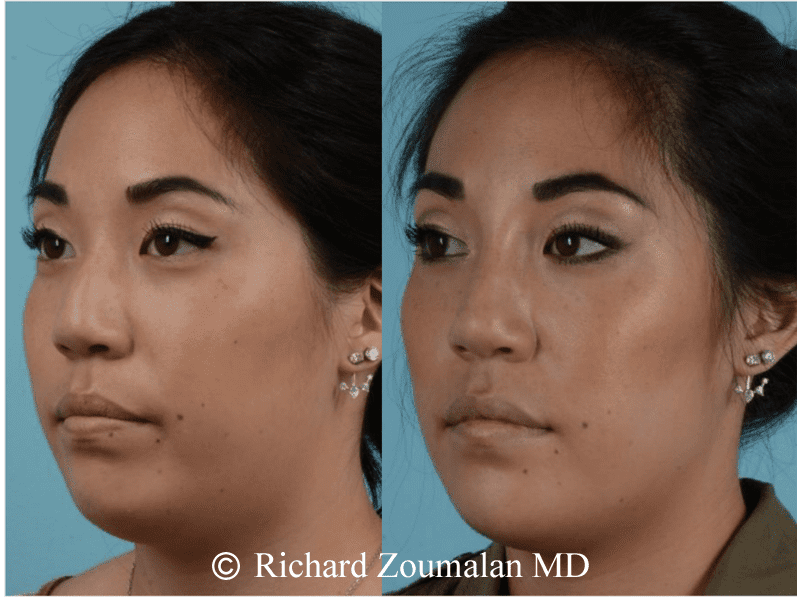 This knowledge is essential in knowing how to perform non-surgical Rhinoplasty without causing serious complications that may require reconstructive surgery. Certain areas and certain techniques are safer than others, and Dr. Zoumalan can help educate you about this. 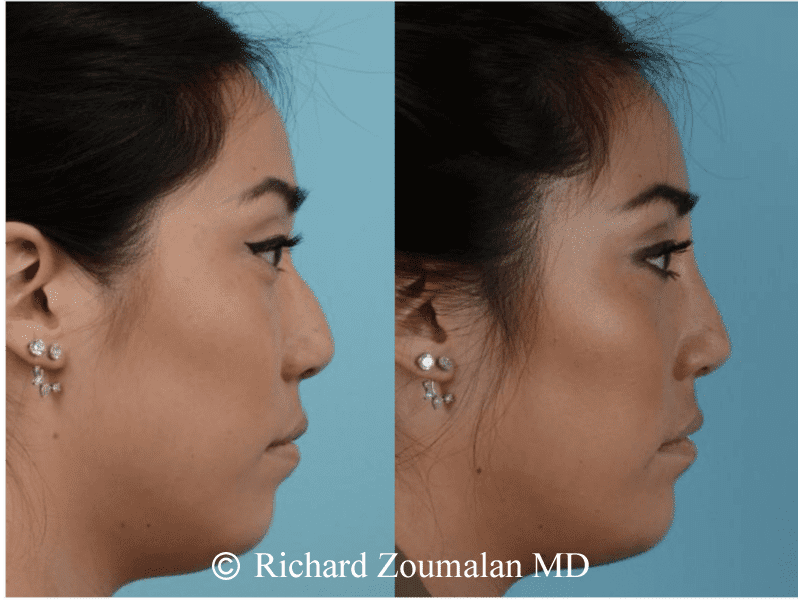 How do I know if I am a candidate for Non-Surgical Rhinoplasty? The best and safest way to do this is by having your nose evaluated by a doctor who performs both surgical AND non-surgical Rhinoplasty. This way, you can get a thorough evaluation and all your options. This includes both an internal and external examination of your nose. This also requires an understanding of your medical history as well as aesthetic goals. Non-surgical Rhinoplasty can also have implications of breathing if too much material is placed in the wrong area, for example in the internal valve mid-nose area. After Rhinoplasty, many patients experience excessive scar tissue. Usually, this excess scar tissue is found above and around the tip. Some patients end up with what is called a “polly beak deformity” due to excess scar tissue above the tip. Others have excess scar tissue around the tip just from surgery. This scar tissue causes thickness, even though the underlying structures were sculpted well. Steroid injections of material such as Kenalog can help thin this scar tissue and sculpt the nose. Steroid injections are really reserved for those who have had previous surgery or trauma to the nose. It is not a good treatment for patients who don’t have any scar tissue from previous injury or surgery. This is an off label use of 5-FU combined with Kenalog steroid which has been used on scar tissue due to previous surgery. Dr. Zoumalan can discuss this with you during your consultation.